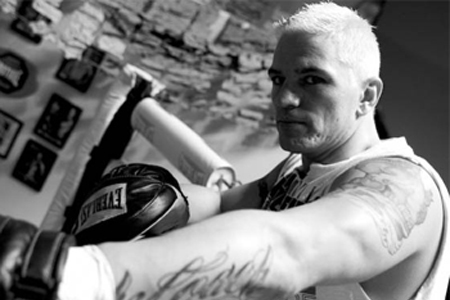 Mixed martial arts legend Shawn Tompkins (Pictured) passed away at the tender age of 37 on August 14th. “The Coach” was laid to rest five days later at the West Park Baptist Church in London, Ontario, Canada. On October 28th, Tompkins’ friends and family will be hosting a public memorial service at the Tapout Training Center in Las Vegas, Nevada from 6PM to 8PM. The event will include food, beverages, music and a silent auction that will support the Tompkins Memorial Fund. Guest speakers include Tompkins’ proteges Sam Stout and Mark Hominick, longtime friend Bas Rutten, as well as journalist Mike Straka. Bidding for the silent auction will start promptly at 6:30PM, with the winners being announced at 7:45PM. Items up for auction will include autographed sports memorabilia from UFC, NFL and MLB athletes, among many other items. The highly-respected trainer died after suffering a heart attack in his sleep. He is survived by his wife, Emilie, who is the sister of Sam Stout. Fans are also encouraged to visit the “Celebrate the Coach” Facebook page to share photos and comments of their memories of Tompkins.